Blend all sauce ingredients together in bowl and set aside. Heat turkey patties in 350°F. oven for 10-15 minutes to an internal temperature of 140°F. Lay out buns. Spread a #40 scoop of sauce on bottom half of the bun. 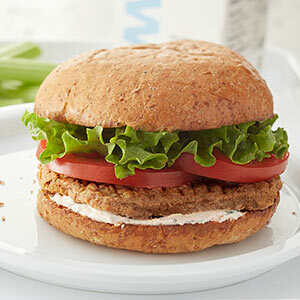 Stack a turkey patty, 2 slices tomato and 2 leaves (¼ c.) lettuce on the bottom of each bun and finish with bun top. MEASURE: 1 qt. 2 c.
MEASURE: 1/4 c. 2 tbsp. 1 serving provides 2 oz. meat/meat alternate, 2 bread/grain and ¼ c. vegetable. Greek yogurt, plain 1 qt. 2 c. 3 qt. Sriracha sauce 3 tbsp. 1/4 c. 2 tbsp. garlic, granulated 1 tbsp. 2 tbsp. Lemon juice 1/4 c. 2 tbsp. 3/4 c.
Black pepper, ground 1 tbsp. 2 tbsp. Cilantro, chopped 1/2 c. 1 c.
All Natural Dark Turkey Patty FC, 2.54 oz., #6148-31 50 ea. 8 lbs. 100 ea. 16 lbs. Hamburger bun, 4", whole grain 50 ea. 100 ea. Sliced tomatoes, 1/4" 3 lbs. 6 lbs. Green leaf lettuce 2 lbs. 8 oz. 5 lbs.